Those strong consumer confidence numbers came as the new year dawned with some horrific announcements from the biggest department stores, traditionally the beneficiaries of consumer confidence and also big employers. Indeed, Macy’s plans to close 100 stores. Sears is shutting 30 Sears and Kmart stores in addition to selling its well-respected Craftsman tool line to raise cash. The list of such announcements is unprecedently large and still growing. Moreover, Morningstar analysts pointed out in October that when an anchor store like Sears or Macy’s closes, that event often triggers “co-tenancy” clauses that allow the remaining mall tenants to terminate their leases or renegotiate terms. This fact supports to Credit Suisse’s estimate that, if Sears continues to close stores, about 200 shopping malls are at risk of shutting down. It is hard to believe that the trend in retail will not have an impact on U.S. employment and, indeed, on overall consumer behavior. We have two systems to do one job. Companies have to support the old as well as the new technology. People no longer buy everything in stores, but stores are still necessary. (In 2016, e-commerce totaled [only] about 8% of retail sales.) Still, the loss of sales makes the brick-and-mortar stores less productive, and their loss of productivity offsets some or all of the gains from digital technologies. Macy’s and Sears have to invest in the new technology, even as the value of the old technology erodes. As I write this report, my partner Bogumil points out that major retailer Target just announced a 3% year-to-year drop in the November/December holiday season store sales while digital sales grew more than 30%. As a result, overall sales for the period declined 1.3%. Samuelson lists other industries and products where “parallel technologies” compete: smartphones and traditional landlines; paper and digital newspapers; cable TV and streaming internet video, etc. The fact that structural shifts can make accepted economic statistics and indicators misleading or even obsolete is not a new realization. In what would probably be considered a politically incorrect example today, Nobel Laureate Paul Samuelson often joked that if a man married his maid, GDP would fall because the money earned by the maid had been counted in the GDP, whereas the new wife’s chores would not earn her a salary — so her work would not be counted. In the physical economy, almost every activity is measured in dollars. If more dollars are spent or earned, we conclude that the economy is growing. But this economy is anemic, struggling, biased toward inflation and shrinking. In the virtual economy, a lot of the services provided to us are free. If we paid dollars for these services, they would be counted as part of the GDP and would add to economic growth. But we don’t, so they are not counted. A pity, because this economy is robust, biased toward deflation, and growing at staggering rates. Larry Downes explains in the Washington Post (10/24/16) that key economic benchmarks, including the GDP, historically ignore everything without a price! And Edoardo Campanella, in a Project Syndicate article (11/4/16), confirms that national accounts ignore most of the highly valuable services provided for free by tech giants like Wikipedia, Facebook, Twitter or Google. Is it possible that, broadly speaking, a lag in middle-class incomes is being off-set by a rising standard of living? This would explain the statistical contradictions puzzling observers today. Davidow suggests that many economists, policy makers, and politicians, using 20th-century methods to analyze our 21st-century economy, fail to grasp the situation. But, in an op-ed for the Los Angeles Times (8/1/16), Daniel Griswold of George Mason University reminded us that American manufacturing is actually at a peak, not a trough. Industrial production hit a record high just before the Great Recession and is nearing that level again. The apparent contradiction stems from the fact that, while U.S. factories are about 2.5 times as productive as they were in the early 1970s, this massive expansion in output was achieved with fewer and fewer workers. According to government data, manufacturing employment has fallen from 19 million in 1970 to about 12 million today. First, the production of less-expensive goods, like T-shirts, toys, and the like, has long since gone offshore. As a result, manufacturing in the US is disproportionally a high-end activity: heavy machinery, tools, cars, jets. Third, in the digital age, manufacturing incorporates a growing proportion of services input; today, more “manufacturing tasks” are performed by people who do not work directly at manufacturers. So, manufacturing probably supports more employment than people think. According to Alana Semuels (The Atlantic 1/6/17), manufacturing still makes up about 12.5% of America’s GDP, the same as it did in 1960, but with proportionally fewer people. As a result of this trend, the average factory worker now makes $180,000 of goods every year, more than three times what he or she produced as recently as 1978. Is the trade deficit a measure of the economy’s dynamism? Today’s economic models — and the institutions using them for forecasting and policy-making –rely on a built-in theory of the economy which enables them to “assume” certain relationships. According to Robert Skidelsky (Project Syndicate -12/19/12), it is among these “assumptions” that the source of recurring errors in economic analysis and forecasting can be found. In the “prehistoric” times when I learned economics in business school, one of these assumptions was that when a country incurs a trade deficit with the rest of the world by selling fewer goods and services abroad than it buys, it must make up that deficit by borrowing or somehow attracting an equivalent amount of capital from other countries. Since then, the frantic globalization and financialization of the world economy have turned this assumption on its head. Today, the vast number of financial transactions between countries dwarfs the value of international trade in goods and services. My own observation is that international capital is attracted to a country either by higher interest rates, attractive investment opportunities or safety considerations. When the amount of capital flowing into a country increases, consumption and investment in that country rise, leading to increased imports – especially since, as a result of the capital inflows, the local currency generally has appreciated. Since exports are not increased at the same time, and may in fact be reduced by the currency’s appreciation, the country’s trade balance deteriorates toward deficit. In the last 6 years, American imports have exceeded exports by about $500 billion a year. In the same time, Net Foreign Ownership of American capital assets has risen by an average of $900 billion per annum – nearly double the pace of the trade deficit growth. Gregory Mankiw, professor of economics at Harvard concludes that, rather than reflecting the failure of economic policy, the trade deficit may be better viewed as a sign of success. As such, he argues that if President Trump wants to restore growth, focusing on the trade deficit may not be the best way to achieve it. There is an additional way in which trade statistics may be a poor guide for policy-making. According to Mark Perry, scholar at the AEI and professor at the University of Michigan, “Importers are exporters and exporters are importers” (AEIdeas — 1/6/17). According to The Economist, every $100 of goods the United States imports from Mexico contains $40 of goods that it had previously exported to Mexico and that are embedded within the products returning as imports. Meanwhile, the Wall Street Journal reports that the 2017 Chevy Cruz actually contains a large foreign content (56%) whereas, year after year, Toyota and Honda have dominated the rankings of the most “American-made” cars. AEI Scholar Mark Perry, reminding us that many of today’s statistical distortions are related, points out that many of the items falling in price are manufactured goods. Many of these manufactured goods, like TVs and appliances, come from overseas, where labor costs are cheaper. On the flip side, he says, goods like education and medical care can’t be produced in a factory, so trade-related pressures do not apply. 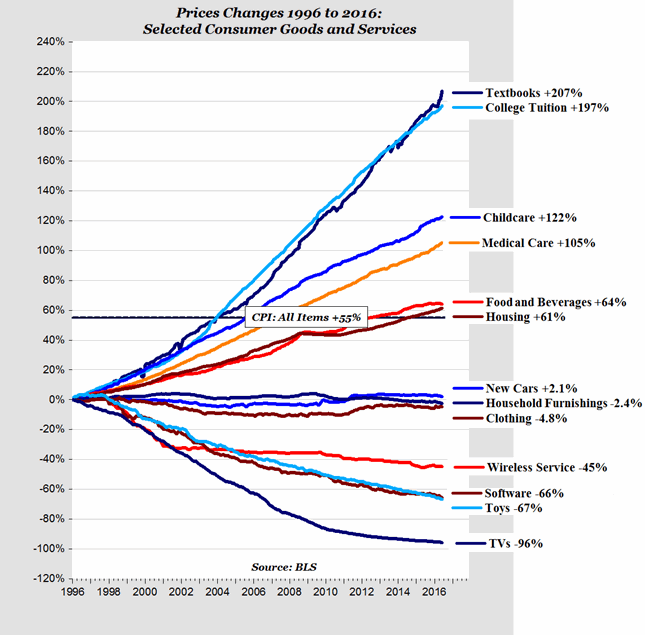 Further complicating the measurement of inflation’s impact on households is the fact that– through private and public insurance or other forms of assistance – many Americans are insulated from the full cost of the services with the fastest price inflation. Unfortunately, others are not. Not surprisingly, the arms of government which, like the Federal Reserve, dispose of a single tool (like the supply of money) to regulate a diverse economy, are in the position of a car-owner trying to fine-tune a carburetor while wearing boxing gloves. Other government agencies that, in theory, dispose of a more diverse arsenal of policy tools, are often paralyzed by lobbies and other political considerations. In politics, acknowledging that problems are complex does not get as many votes as oversimplifying slogans. Faced with this confused and confusing policy environment, what should investors do? This a question that I will attempt to answer in my next article. This report is not intended to be a client‐specific suitability analysis or recommendation, an offer to participate in any investment, or a recommendation to buy, hold or sell securities. Do not use this report as the sole basis for investment decisions. Do not select an asset class or investment product based on performance alone. Consider all relevant information, including your existing portfolio, investment objectives, risk tolerance, liquidity needs and investment time horizon.. This report is for general informational purposes only and is not intended to predict or guarantee the future performance of any individual security, market sector or the markets generally.